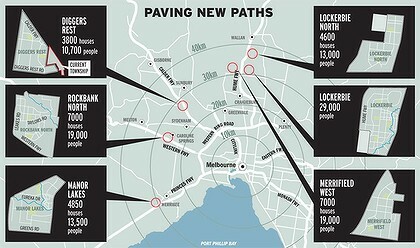 SIX new suburbs are planned for Melbourne, with a dozen new train stations already earmarked. New communities housing more than 100,000 will be created north and west of the city in places such as Diggers Rest, Lockerbie, Manor Lakes and Rockbank North. The Herald Sun can reveal that 6000ha of land outside the city fringe will be brought into the urban growth boundary for housing development. Wallan and surrounding areas comprise about half of the total. Other parcels of land are at Pt Cook, Greenvale, Melton, Pakenham, Cranbourne South and South Morang after a review process involving local councils, community groups and government departments, such as the Growth Areas Authority. Planning Minister Matthew Guy said the inclusion of more land within the city's boundary and the release of the growth corridor's blueprint would enable proper planning for housing, community infrastructure and job needs in coming decades. "It's all about managing Melbourne's growth over the next 30 years," he said. "It ensures liveability, housing affordability and economic growth, particularly job growth for Melbourne in our outer-growth areas." New suburbs will provide inner-city-style living with many residents working close to home in employment precincts on Melbourne's fringe. It is estimated construction work worth $7.4 billion for 35,000 land lots in the six new suburbs will generate at least 66,000 jobs over 20 years. While funding has only been approved for stations at Wyndham Vale and Tarneit as part of Regional Rail Link, talks are under way for developers to pay for some other stations and road infrastructure instead of tax contributions. Mr Guy said the amount of new land released was modest compared with the 43,000ha released in 2010 by the Brumby Government. "Victorians should be very comfortable that the Government has set the standard very high for transparency when it comes to any future growth boundary movement," he said. MOST of Melbourne's six new suburbs will have to rely on the busy V/Line train network or public transport upgrades that are years from completion, which critics say will worsen congestion and commuting times. Planning Minister Matthew Guy yesterday announced the development of six new suburbs - Diggers Rest near Sunbury, Lockerbie near Greenvale, Lockerbie North, Manor Lakes in Wyndham, Merrifield West in the city of Hume and Rockbank North near Melton. Mr Guy also revealed the city's urban growth boundary would grow by almost 6000 hectares, with former farm and green wedge land opened up for development at Wallan, Point Cook, east of Pakenham and in Melton. Residents could be moving into some of the new suburbs within two years, and they would be provided with ''sophisticated'' town centres, a range of housing, good services and land set aside for local employment, Mr Guy said. Plans from the Growth Areas Authority show Merrifield West residents will have to rely on the Donnybrook V/Line rail station or drive seven kilometres to the Craigieburn rail station. Rockbank North and Lockerbie will be near busy V/Line rail stations, while a rail station is ''proposed'' for nearby Beveridge. Diggers Rest will see an ''expansion'' of its V/Line rail station but no date is given. V/Line patronage has soared in recent years, with many lines offering standing-room only on peak services. Monash University transport expert Professor Graham Currie said locating suburbs near V/Line stations was positive but questioned their capacity. ''All of the best evidence from round the world show the provision of transport services should happen before development occurs,'' Professor Currie said. Wyndham mayor Kim McAliney said it would be a challenge to accommodate more residents but commended Mr Guy on visiting the fastest growing area in Australia to see the challenges first hand. ''We are no longer prepared to approve any more plans for new developments - we're drowning, that's how I feel,'' Ms McAliney said. Mitchell Shire mayor Sue Marstaeller said she was pleased that Wallan had been brought within the urban growth boundary because it would make planning easier. Lockerbie, a $4 billion development from Stockland, will be one of the state's largest greenfield residential projects. Melbourne's 10 largest property developers control 70 per cent of active land supply, said leading analyst Colin Keane from the National Land Survey Program. Median land prices in outer growth area suburbs have fallen every month since mid-2011. But despite prices declining, most of the available land was still out of the reach of first home buyers, with only 32 per cent priced under the critical $200,000 barrier, Mr Keane said. Well of course there is no PT, no one lives there yet! Cities should be more polycentric I think. Get another CBD on the edge, that way you use up the counter-peak capacity as well.